Being laser-focused on improving your online presence and website is essential. Here are some digital recruitment tips to help assess and audit your company’s websites and change your interview process. Yes, there is a difference between the two! Often, we see organizations wanting to include these elements in their job postings or careers page. But doing so only hurts your chances of being seen by candidates. Use your corporate site to tell job candidates WHY they should work with your organization and your careers page to show them HOW they can work FOR your organization . 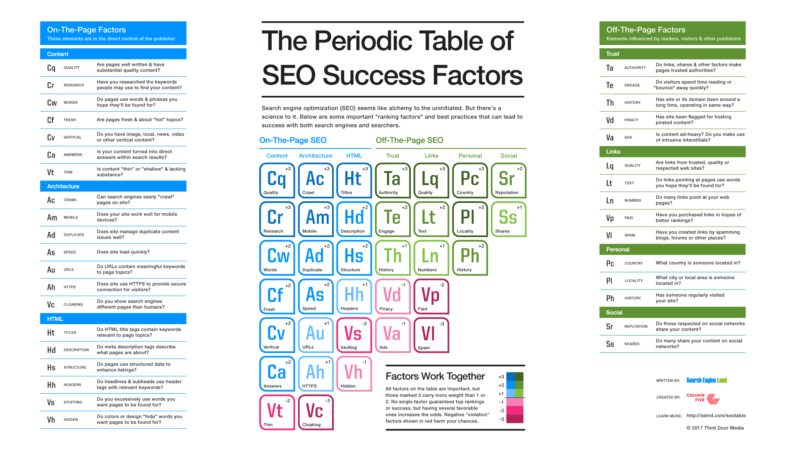 Unless you’re a Marketer, you probably aren’t super familiar with SEO (search engine optimization) and how your organization can be better at it. results’ listing – often referred to as organic results. This means that the more SEO-friendly your website is, the more traffic you’ll get. The more effective you are with your placement and choice of keywords, the more people searching for those terms will have visibility to your job openings. It’s amazing how this can significantly impact your ability to drive applicants. Without it, recruitment teams will be forced to source and will not benefit from inbound traffic. In addition to making your site “SEO Successful,” you must also ensure that your site is mobile responsive. Did you know that 78 percent of all Millennial job seekers use their mobile device for a job search? Did you also know that if the process is too complicated, 60 percent of those candidates will abandon their application? It means you need to simplify your application process. By making your careers page mobile and consumer friendly, you will see an improved page ranking on Google, a decrease in cost-per-apply and an increased number of qualified candidates. Now that have your website search engine optimized (SEO), audited and mobile friendly let’s get to marketing those jobs. “Post and pray” is not a viable strategy for marketing your job openings. If you’re just slapping your company’s jobs on job boards, you must seriously rethink your approach! There are endless ways to market your jobs. And they're all rooted in determining where your job prospects are (on and offline) – and marketing there. Go to job hunters; don’t expect job hunters to come to you. The ideal marketing strategy is a marketing “mix,” combining a variety of tactics to reach your target audience. Here are a few ways to better market your company’s job openings to facilitate successful recruitment. First, let’s talk about marketing online. We wrote an entire eBook on this, but I’ll keep it short and sweet (for this post, at least). Where are your potential job candidates in the digital world? Generally, we can narrow this down to three, main spaces. This is something you can do for free. Something that’s not free but can pay dividends? Google AdWords: targeted advertising on Google. By setting up an AdWords campaign, you can ensure you’re reaching people that match your target audience when they’re searching for words and topics related to your job openings. Think of it as a way to be at the right place, at the right time. These are the ads you see at the top of your search results or off to the sides of certain websites. By now, you don’t need any convincing on the importance of social media. In fact, 92 percent of companies are using social media for recruiting—which is great! But, how many organizations are tapping into social media's full potential to market their jobs? At the very least, you should ensure your company and your employees are posting links to your job openings on their networks regularly. This will engage those already aware of your company (your followers) and potentially attract employee referrals (because they're tapping into their own networks). On LinkedIn, you can even target people with specific job titles and seniority or that work for companies (think of your competitors). 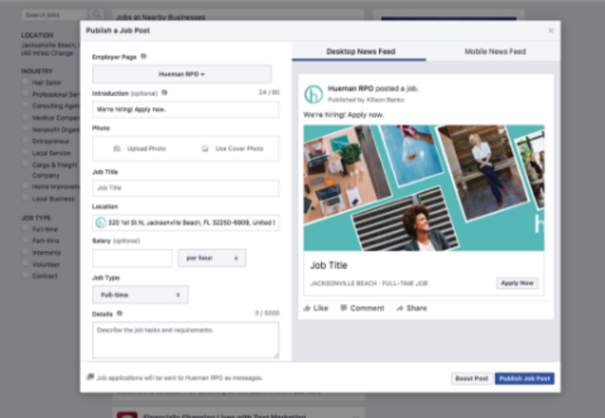 On Facebook (in addition to the traditional ad types) you have the opportunity to create a job posting where someone can apply directly on the platform. You can sponsor it for more visibility. 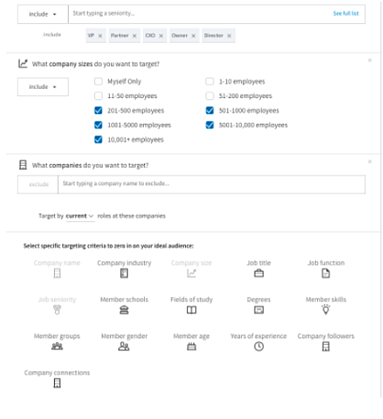 Ensure you have the "jobs" option selected for the menu of your company's Facebook page. There are a variety of different ad types depending on your goals, so ensure you think through the KPIs that will best measure your success (is it impressions, clicks or conversions? ), and go from there. But, that's good news for you. You can get someone to look at your job from just about anywhere! We've already discussed social media and Google, but let's not forget the email inbox. When you have job openings, market them to your email databases regularly. Send out links to the job opening and provide contact information of your recruiters and HR department. Include content that can potentially answer job candidate questions and reduce hesitations so you can get more qualified applicants. Do you have a job benefits page you can link to? An employee testimonial video? What content can you use to go beyond marketing your specific job, but a career with your company? As I mentioned, your job-marketing strategy should be a mix. While it’s important to market your job prospects online, don’t neglect the opportunities offline. Again, it's all about marketing where your audience already is. Marketing your job through an event can be especially helpful, as it ads that personal touch you can't get through a phone or computer screen. Want to learn more tips and tricks to improve your digital presence? Have questions? Email us at info@huemanrpo.com, learn ways you can reach even more job candidates.